Injection Molds and Injection Molding. Long Island, NewYork. ISO 9001 Certified. Located within the New York, New Jersey, and Connecticut area. Injection Molds, Expert Mold Design and Moldmaking, Injection Molding and Plastic Parts. Benefit from our expertise and production capabilities for your Injection Molds and Injection Molded Plastic Parts. Expert Mold Design and Mold Manufacturing capabilities using the latest CAD systems, including Moldflow analysis, and Precision CNC machining Centers. Injection Molds. Our mold makers stand behind your tooling and injection molds. Dedicated and highly trained moldmakers serve as your full service and support team to keep you producing and producing. Wide range Plastic Injection Molding capabilities through our close relationships with key quality molders. Our Machine Shop utilizes the latest technology in manufacturing including Precision High Speed CNC Machine Tools, and inspection and quality control with our (German Built) Wenzel CMM Coordinate Measuring Machine (CMM). Precision Machine Shop. CNC Machining and Assemblies. ISO 9001 Registered Quality Assurance. All manufacturing located in central Long Island, within the New York, New Jersey and Connecticut region. Our highly skilled CNC machining team has expertise in key manufacturing technologies and techniques. 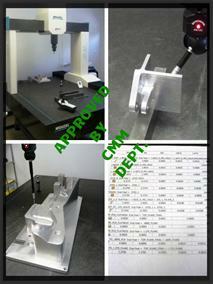 Precision CNC Machining with CNC Coordinate Measuring Machine (CMM) Inspection . Customers can count on Reliable, High Quality Manufactured Precision CNC Machined Components and Assemblies. Precision Equipment. High Precision and High Speed CNC Machine Tool Technology, with capabilities through 4 axis machining. Inspection Capability. Fully calibrated Quality Control Equipment and Test Instruments including our 36" x 40" Wenzel Full CNC CMM Coordinate Measuring Machine. ISO 9001 Certified Quality Assurance. 30 Years of Reliable, Quality Moldmaking, Injection Molds, Injection Molding, and Precision CNC Machined Parts. VISIT our machine shop and inspect our manufacturing facility. We are committed to your quality! Our systems have achieved ISO 9001 Quality Certifications . We focus machine shop to provide quality and fast delivery of your Injection Molds, Injection Molded Parts, and CNC Machined Parts. We want to build in your trust that our machine shop can deliver the results you require! Injection Molds, Injection Molding, Precision CNC Parts and Assemblies,and Machine Shop Services. We manufacture to meet your requirements and build your success! Full service manufacturing of Injection Molded Plastic Parts, Injection Molds, and Precision CNC Machining, and Machine Shop Services. ... from our headquarters in Bay Shore, Long Island, New York.